2017-11-03. Published in category NOAHIDE-LAWS. Before you respond, “NO, that cannot be – not in our free country!” let me explain. The passage of this law, HJ Res. 104, is especially troublesome to me because I was a member of the U.S. House of Representatives at the time it was passed. Even worse, I was in the House Chamber the very day that is was passed, voting on other legislation. Yet I, as a U.S. Congressman, had NO KNOWLEDGE that it had been passed or even that it was to be brought up for a vote. How could this be? How could the deception be so pervasive that those of us who had sworn to uphold our country’s Constitution, particularly those of us (few, indeed) who really took our position seriously as the protectors of the people, could be totally in the dark regarding the content of this bill and its passage by the leaders of this country – by treachery and deceit? The Resolution, first introduced by Minority Leader, Rep. Robert H. Michel of Illinois, was then referred to the House Post Office and Civil Service Committee. Early in March 1991, 225 members of the House had signed on as co-sponsors of this Resolution, but it is highly doubtful they were given the full text of the document. They were probably told only that it was a Resolution in honor of Rabbi Schneerson’s birthday. Most likely they had no knowledge that the treacherous Noahide Laws were a silent attachment. I was not one of the co-sponsors. The committee referred this Resolution to the House for a vote on March 5, 1991. But here is where the real treachery begins! 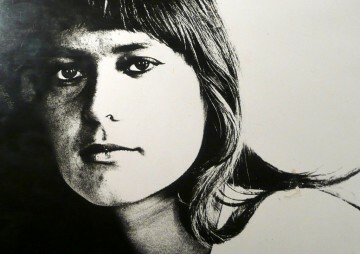 The record states that the House of Representatives passed this Resolution by “Unanimous Consent.” But what the average American does not know is that “Unanimous Consent” is a euphemism for getting a bill passed “under the radar” with almost NO ONE present to vote AND with NO RECORD of who voted or HOW they voted. A Congressman’s ears prick up when he hears the words “Unanimous Consent” because he is aware that this may be a signal for skullduggery. And in this case, it most certainly was! On the day this Resolution was “passed,” the entire membership of the House of Representatives had already been dismissed after having been told that the day’s work, including all the voting, was over. We could all go home. It was THEN, after virtually ALL members had left, that the traitorous authors of this Resolution brought it up for a vote on the House floor – with only four hand-picked members present. It was then deceitfully “passed” by “Unanimous Consent” on March 5, 1991, by voice vote with almost NO ONE there and NO RECORD made of their names or how they voted. Two days later, on March 7 1991, the U.S. Senate passed the Resolution by voice vote, also with no recorded vote. On March 20, 1991, it was signed by President George H. W. Bush and became Public Law 102-14. As you read on, you will discover the identity of the evil forces that have so much control over the U.S. Government that they can accomplish these dastardly deeds under cover of darkness. 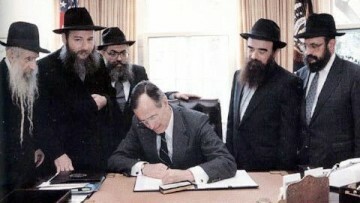 Bush senior signerar år 1991 Noahide lagarna under judarnas vakande ögon! Uppenbarelseboken 20:4 Och jag såg själarna av dem som hade blivit halshuggna för Jesu vittnesbörd och Guds ord och som inte hade tillbett vilddjuret och dess bild eller tagit emot märket på sin panna eller sin hand. Previous post: The Noahide Laws A universal code for peace and unity - Christians killed! Next post: Kan man bli frälst om man inte lyder Gud?